I was joking around, saying I want a Cinderella-themed bridal shower. I don't. At all. Unless I think really hard, I don't even I know the story of Cinderella. There are so many women, though, who dream of a Disney wedding, dream of getting married at Cinderella's castle, dream of a Disney princess engagement ring. And, according to the Internet, there's a new line of the latter. I'm so behind on my Disney cartoons. I think the last one I saw in the theater was The Lion King. Or Pocahontas. I'm not sure which came out second (Okay, I googled. The Lion King came out in 1994 and Pocahontas was 1995, so it was Pocahontas). I have no idea who Aurora is. At all. (Okay, this post is taking forever because I keep googling stuff I don't know. Turns out Aurora is Sleeping Beauty. Really? She had a name? I thought she just had a spindle). 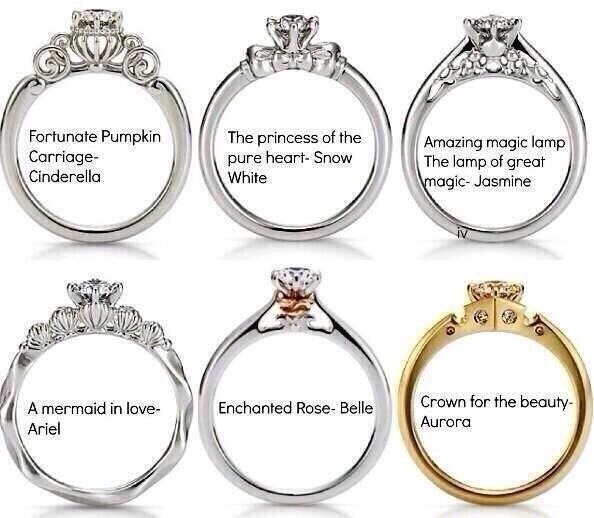 Anyway, back to the point at hand: This photo of Disney princess engagement rings is floating around the Internet. I've seen it all over, but no one has actually given credit to where it originated and no one has actually claimed to have originated it. So, there are a lot of missing details in this post. But, the rings are very pretty (especially the Cinderella one). BRIDAL BABBLE: Which of the Disney princess engagement rings do you think is best? I love the Cinderella and Belle ones. My middle child loves the Ariel one. those are so pretty, we used white gold bands and I always wanted to design a special engagement ring... but we were not really engaged for any length of time (a couple weeks) before we got hitched... next wedding perhaps! Are these available for purchase yet? I'm close to deciding on a ring but I wanted to compare if possible. Oh my, these are great, I love the designs created around the Disney princesses. I never would have thought. I don't think I could pick a favorite. Thanks for stopping by and sharing on Throwback Thursday Blog Style. I can't wait to see what you share this week. I thought I recognized this post. I still think these are great. Thanks for stopping by Throwback Thursday. I like the bell one.